Are the students in your family preparing for NECAP GLEs? Whether it’s NECAP Reading, Math, Science, or Writing, the more you know about these New Hampshire standardized tests, the better. NECAP GLEs, or the New England Common Assessment Program Grade-Level Expectations, are administered to students in third grade through high school. These New Hampshire standardized tests assess reading, math, science, and writing proficiency with the goal of providing actionable data that will help parents, teachers, and students improve school performance. New Hampshire standardized tests are also used to determine Adequate Yearly Progress (AYP) as required by the federal No Child Left Behind Act (NCLB). Time4Learning, an online service that teaches critical math and language arts skills, offers this page to help you understand New Hampshire’s NECAP GLEs and how you can help your children prepare. Aligned to New Hampshire State Standards, the NECAP GLEs measure how well your child has learned each subject, based on grade level expectations. In October, NECAP GLEs in Math and Reading are administered in third through eighth grades. NECAP Writing is given to 5th and 8th graders at the same time. In May, NECAP Science is administered in 4th and 8th grades. Eleventh grade students take NECAP Grade-Span Expectations (GSEs) tests in Math, Reading, Science, and Writing, which are specifically designed for high school students. As criterion-referenced tests, your child will only compete against him or herself, and will be scored on one of four levels: substantially below proficient; partially proficient; proficient; and proficient with distinction. While the objective of all NH assessments is for every student to score at or above the proficient level, students do not have to score at a particular level to be promoted or to graduate from high school. The New Hampshire Alternate Assessment, known as NH-Alt, provides a testing alternative for students with severe disabilities. English Language Learners take the ACCESS for ELLs® test each year until they have acquired English Language proficiency. New Hampshire also participates annually in the National Assessment of Educational Progress (NAEP), known as the Nation’s Report Card, where a sampling of students (from grades 4, 8, and/or 12) are tested in several content areas as part of a nationally representative assessment of student performance. In addition, the state has developed a program for educational improvement, known as the New Hampshire Educational Improvement and Assessment Program (NHEIAP), which includes assessments. Students are tested at the end of 3rd, 6th, and 10th grades in English language arts and math; as well as at the end of sixth and tenth grades in science and social studies. These standards-based tests are designed to help educators make informed decisions about curriculum and resource allocation. For general tips on test preparation, please visit our standardized test overview page. The real preparation for the NECAP GLEs, and all standardized tests that assess a wide range of fundamental skills, is a long-term program of strong education. Many families make special efforts to help their students, which should start with being sure that students are doing their homework and reading on a daily basis. In addition, many families involve tutors or use an online learning program such as Time4Learning. 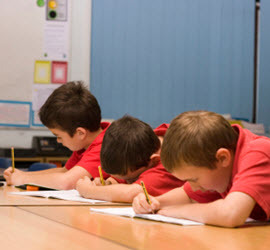 In addition to building fundamental skills in math and language arts, many families also use test prep programs or books to help their students become familiar with the format of the tests, to learn test taking strategies (when to guess, when not to), to get used to the time restrictions, and to learn some strategies for questions. For instance, many test prep programs teach students when faced with a reading passage followed by comprehension questions, to scan the questions prior to reading the passage so that you can pay special attention to the areas that are addressed by questions. Time4Learning is not a test prep program, it is a program that builds the skills that will be tested.